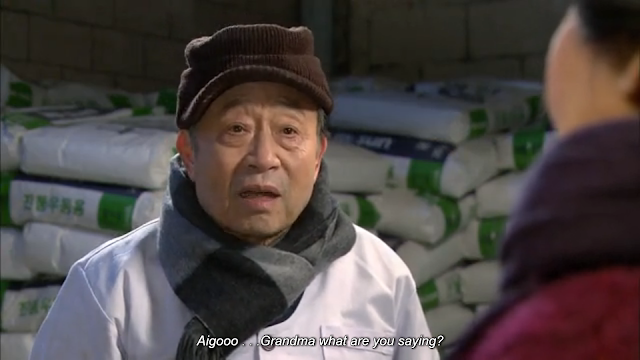 Kdrama Harabeojis (grandpas) can either be the best cheerleaders to their grandchildren or their worst enemy. Today, I am counting down the Top 5 best Kdrama Grandpas I've seen so far starting with number 5 and working my way to the top of the list. Pal Bong isn't the main character's grandfather, but is the grandfather of his (eventual) love interest and takes on a grandfatherly role for Tak Gu who has no real family of his own. With Tak Gu, his own granddaughter, and all those who look to him as a mentor he teaches the importance of hard work. He teaches them the value of doing what's right in life, rather than looking for ethical shortcuts. He is a stern but caring teacher and respected by all those who know him. We get a 4 for 1 deal in Miss Korea with Jong Koo, his two sons, and grandsons living together and all looking out for his granddaughter, Ji Young. He's the patriarch and therefore directs their collective reactions, which are always protective of Ji Young. He's always looking out for her best interest and is obviously a very generous man who his family likes to be around considering they ALL still live with him. At home, Man Bok was known as a frugal and stern patriarch, while to the family whom he chauffeured for he was always a teddy bear. When times get hard and the tables are turned, the family he worked for has to live with and work for him. He has to take the same stern approach with the their family that he did with his own and becomes a father and grandfather to their family as well as his own. He has a warm heart toward them all but has to be stern with them only for their own good. He provides for an extensive amount of people under his care and not only that, but helps them develop into decent people which for some of the characters in question is a massive feat. The family in this drama touched my heart so many times. Grandpa, Grandma, Dad, Mom, Uncles, Aunts, and Cousins all living under one roof (as part of a special competition for Grandpa's inheritance). They don't always get along, but they always have each others' backs. No one more so than Paeng Dal who goes to extreme lengths to help his children and grandchildren become responsible adults who value hardwork and family. There is no one more protective of their granchildren than him; not to mention the fact that he tried leave his entire business to one of his granddaughters over everyone else in his family. Seriously, I can't tell you how much I wished I was part of this family with this great patriarch at the head. Sook Ju could trend #GrandpaGoals. He is the most supportive grandfather I've ever seen in a Kdrama, almost always taking his grandaughter's side, even against her loveable but naive father. He is incredibly loyal and will go after anyone that dare say anything against his beloved granddaughter. And when her fiance's family is against their relationship, he forbids her from joining their family on the sole basis that they have anything bad to say about her. Rather than trying to force her into a relationship that she's unsure of like the rest of her family, her grandpa always insists that she goes by her heart and does what she wants, even making sure others don't interfere with her deciscion process. And the best thing about Sook Ju is that he isn't just a quiet little grandpa. He's quirky and a bit of a Cassanova and he always says things like he sees them. Talk about respecting your grandchildren as individuals, no one does that like Sook Ju. NO ONE!